The biggest Wi-Fi security flaw had just been exposed – affecting a large portion of internet connected devices and especially dangerous on more modern devices. To put it simply, your devices such as desktops, laptops, routers, smart TVs, tablets, e-readers, printers or any other smart home devices which uses Wi-Fi for internet connectivity are vulnerable to this flaw. KRACK targets a vulnerability in the 4-way handshake of the WPA2 protocol. Usually, this handshake is executed when a user wants to join a protected Wi-Fi network. To put it briefly, when a client joins a network – it executes the 4-way handshake which negotiates a fresh encryption key. The key will then be installed after receiving “step 3” of the 4-way handshake and will later be used to encrypt the normal data once the connection is established. In other words, it’s used to confirm that both the client and access point has the correct credentials before allowing a connection. However, since messages may be lost or dropped throughout the handshake process, the access point will retransmit “step 3” if it did not receive the appropriate response. 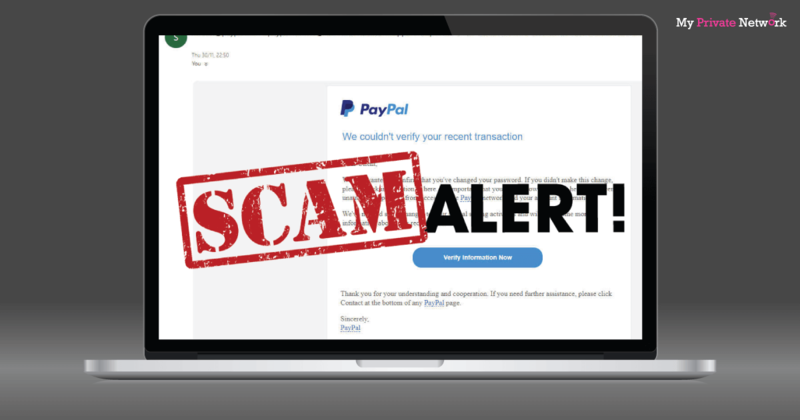 Hence, the client may receive “step 3” multiple times which then reinstalls the same encryption key again and therefore resets the incremental transmit packet number (nonce) – the starting point of the whole exploit. Using KRACK, Vanhoef was able to show that an attacker can force these nonce resets by collecting and replaying retransmissions of “step 3” of the 4-way handshake. By doing so, an opportunistic hacker could maliciously intersect the packets that are being transmitted. Currently, all modern protected Wi-Fi networks use the 4-way handshake which means the attack could also work on older protocols such as WPA or even just AES. It’s absolutely vital that manufacturers quickly deploy patches and that consumers are well aware of the situation! 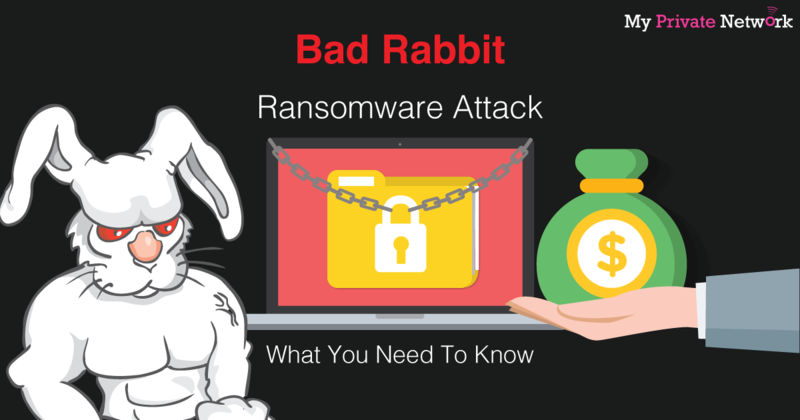 Perhaps the most frightening aspect of this vulnerability – an attacker may leverage it to conduct attacks such as data packet decryption and injection, TCP connection hijacking, HTTP content injection, or the replay of unicast, broadcast, and multi cast frames. The video below created by Vanhoef demonstrates an attack against an Android smartphone. In this demonstration, you can see the types of information that an attacker could obtain which are not limited to just revealing login credentials – but any data or information the victim transmits can be decrypted. 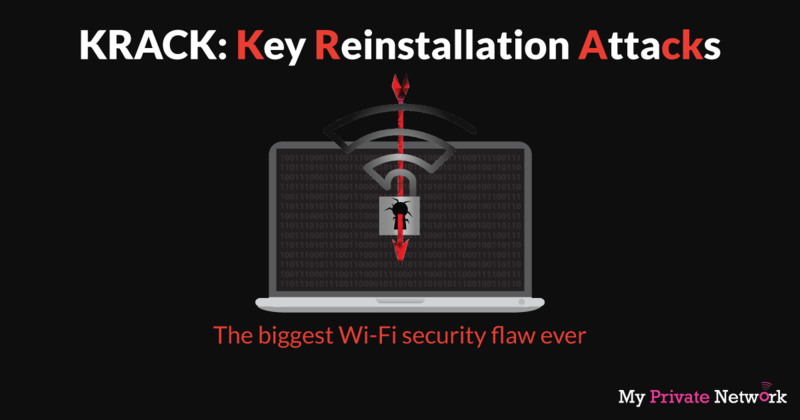 Although the demonstration may seem to portray a quick and easy hack, this is only because the attack is especially catastrophic against version 2.4 and above of the wpa_supplicant – a popular Wi-Fi client which is used on Linux and Android versions 6.0 and above. Android versions 6.0 and above covers about 50% of all Android users and is especially prominent on newer devices. This gravely puts a large portion of internet users in exceptional vulnerable situations to this attack. The bad news – This affects every device that uses Wi-Fi. Then it’s almost certain that you’re affected by this vulnerability. With the vulnerability exposure only barely a week old, it’s very likely that updates will only start being pushed out in the coming weeks. This means that there probably won’t be an instant fix any time soon so you need to take extra precautions until those become available. ● Avoid using Wi-Fi. Since the vulnerability targets your device’s Wi-Fi, the best thing to do is to stop using Wi-Fi altogether. You could use a wired ethernet connection instead or just stick to your cellular connection on your mobile. ● Avoid Public Wi-Fi. If you have no choice, we recommend you to only visit websites that use the “HTTPS” standard. This can be identified by the “lock” symbol in the website’s URL or by simply ensuring that the website URL starts with “HTTPS” instead of “HTTP”. ● Use a trusted VPN. Since VPNs will encrypt all of your connection data using another set of encryption methods, it’ll make it much harder to decrypt any of your data even if you’re being attacked by KRACK. KRACK’s main attack is against the 4-way handshake, and does not exploit access points, but instead targets clients. So it might be that your router does not require security updates. Vanhoef strongly advise you to contact your vendor for more details. In general though, you can try to mitigate attacks against routers and access points by disabling client functionality (which is for example used in repeater modes) and disabling 802.11r (fast roaming). For ordinary home users, your priority should be updating clients such as laptops and smartphones. The 4-way handshake was mathematically proven as secure. How is the KRACK attack possible? The longer answer is mentioned in the introduction of Vanhoef’s research paper: the attacks do not violate the security properties proven in formal analysis of the 4-way handshake. In particular, these proofs state that the negotiated encryption key remains private, and that the identity of both the client and Access Point (AP) is confirmed. 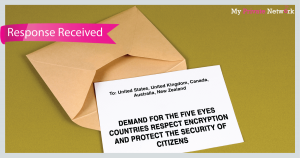 Our attacks do not leak the encryption key. Additionally, although normal data frames can be forged if TKIP or GCMP is used, an attacker cannot forge handshake messages and hence cannot impersonate the client or AP during handshakes. Therefore, the properties that were proven in formal analysis of the 4-way handshake remain true. However, the problem is that the proofs do not model key installation. Put differently, the formal models did not define when a negotiated key should be installed. In practice, this means the same key can be installed multiple times, thereby resetting nonces and replay counters used by the encryption protocol (e.g. by WPA-TKIP or AES-CCMP). NO! Keep using WPA2. WEP is considered the lowest and oldest encryption standard for Wi-Fi security, so you should avoid it. 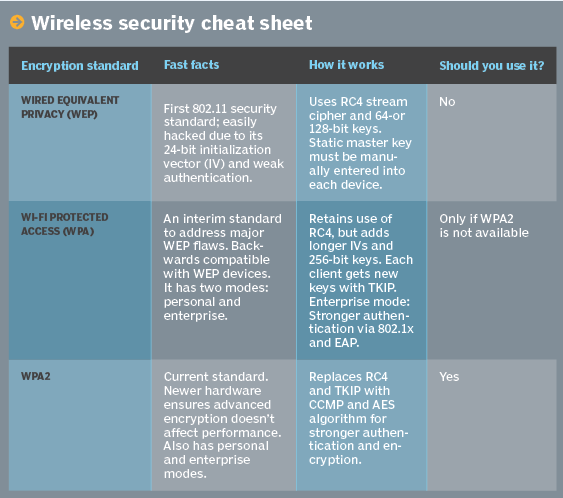 Here’s a quick comparison chart below for an easier overview of Wi-Fi encryption standards. For the full list of Q&A and further information regarding the KRACK attack, we recommend you to visit Vanhoef’s official KRACK website at www.krackattacks.com. Traveling soon? Be sure to travel with a VPN!